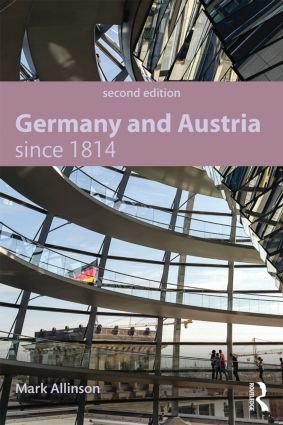 Germany and Austria since 1814 presents an accessible overview of the distinctive historical experiences undergone by both Germany and Austria during this period. Beginning in 1814 with the Congress of Vienna and ending two centuries later with the consequences and ongoing challenges of German and European unification, this book focuses on political history and traces the development of liberal parliamentary democracy in Germany and Austria through to the modern Federal Republic of Germany and Second Austrian Republic, contextualising the Nazi period in both countries. Particular emphasis has been placed on exploring major developments, their causes, and the relationships between them. Fully revised, this new edition has been expanded to include a new final chapter outlining developments in both Germany and Austria from 1990 to the current day, including recent elections, as well as modifications and updates to other earlier chapters. A combined glossary of German terms. Germany and Austria since 1814 provides the essential historical context necessary for an understanding of these pivotal European countries today. It will be invaluable for undergraduate students taking courses in German, History and Area Studies. Mark Allinson is Senior Lecturer in German History at the University of Bristol, UK. His research focuses on the history of the German Democratic Republic and other aspects of the political and social histories of modern Germany and Austria.